14.1. Which of the following examples represent periodic motion? (a) The swimmer's motion is not periodic. Though the motion of a swimmer is to and fro but will not have a definite period. 14.2. Which of the following examples represent (nearly) simple harmonic motion and which represent periodic but not simple harmonic motion? (a) the rotation of earth about its axis. (b) motion of an oscillating mercury column in a U-tube. (c) motion of a ball bearing inside a smooth curved bowl, when released from a point slightly above the lower most point. (d) general vibrations of a polyatomic molecule about its equilibrium position. (a) It is priodic but not simple harmonic motion because it is not to and fro about a fixed point. (b) It is a simple harmonic motion because the mercury moves to and fro on the same path, about the fixed position, with a certain period of time. (c) It is simple harmonic motion because the ball moves to and fro about the lowermost point of the bowl when released. Also, the ball comes back to its initial position in the same period of time, again and again. (d) A polyatomic molecule has many natural frequencies of oscillation. Its vibration is the superposition of individual simple harmonic motions of a number of different molecules. Hence, it is not simple harmonic, but periodic. 14.3. Figure 14.27 depicts four x-t plots for linear motion of a particle. Which of the plots represent periodic motion? What is the period of motion (in case of periodic motion)? (a) It is not a periodic motion. This represents a unidirectional, linear uniform motion. There is no repetition of motion in this case. (b) In this case, the motion of the particle repeats itself after 2 s. Hence, it is a periodic motion, having a period of 2 s.
(c) It is not a periodic motion. This is because the particle repeats the motion in one position only. For a periodic motion, the entire motion of the particle must be repeated in equal intervals of time. (d) In this case, the motion of the particle repeats itself after 2 s. Hence, it is a periodic motion, having a period of 2 s.
The terms sin ωt and sin ωt individually represent simple harmonic motion (SHM). However, the superposition of two SHM is periodic and not simple harmonic. The given function is cosωt + cos3ωt + cos5ωt. Each individual cosine function represents SHM. However, the superposition of three simple harmonic motions is periodic, but not simple harmonic. The given function exp(-ω2t2) is an exponential function. Exponential functions do not repeat themselves. Therefore, it is a non-periodic motion. (f) The given function 1 + ωt + ω2t2 is non-periodic. (f) at 4 cm away from B going towards A. From above figure, where A and B represent the two extreme positions of a SHM. FOr velocity, the direction from A to B is taken to b positive. The acceleration and the force, along AP are taken as positive and alsong Bp are taken as negative. (a) At the end A, the particle executing SHM is momentarily at rest being its extreme position of motion. Therefore, its velocity is zero. Acceleration is positive becaue it is directed along AP, Force is also Positive since the force is directed along AP. (b) At the end B, velocity is zero. Here, accleration and force are negative as they are directed along BP. (c) At the mid point of AB going towards A, the particle is at its mean psoiton P, with a tendancy to move along PA. Hence, velocity is positive. Both accleration and force are zero. (d) At 2 cm away from B going towards A, the particle is at Q, with a tendancy to move along QP, which is negative direction. Therefore, velocity, acceleration and force all are positive. (e) At 3 sm away from A going towards B, the particle is at R, with a tendancy to move along RP, which is positive direction. Here, velocity, acceleration all are positive. (f) At 4 cm away from A going towards A, the particles is at S, with a tendancy to move along SA, which is negative direction. Therefore, velocity is negative but acclereation is directed towards mean position, along SP. Hence it is positive and also force is positive similarly. 14.6. Which of the following relationships between the acceleration a and the displacement x of a particle involve simple harmonic motion? In SHM, acceleration a is related to displacement by the relation of the form a = -kx, which is for relation (c). x (t) = A cos (ωt + φ). If the initial (t = 0) position of the particle is 1 cm and its initial velocity is ω cm/s, what are its amplitude and initial phase angle? The angular frequency of the particle is π s–1. If instead of the cosine function, we choose the sine function to describe the SHM: x = B sin (ωt + α), what are the amplitude and initial phase of the particle with the above initial conditions. Intial velocity, v = ω cm/ sec. 14.8. A spring balance has a scale that reads from 0 to 50 kg. The length of the scale is 20 cm. A body suspended from this balance, when displaced and released, oscillates with a period of 0.6 s. What is the weight of the body? ∴ Spring constant, k = F/l = 490/0.2 = 2450 N m-1. Mass m, is suspended from the balance. Hence, the weight of the body is about 219 N.
14.9. A spring having with a spring constant 1200 N m–1 is mounted on a horizontal table as shown in Fig. A mass of 3 kg is attached to the free end of the spring. The mass is then pulled sideways to a distance of 2.0 cm and released. Determine (i) the frequency of oscillations, (ii) maximum acceleration of the mass, and (iii) the maximum speed of the mass. Hence, the frequency of oscillations is 3.18 cycles per second. Hence, the maximum acceleration of the mass is 8.0 m/s2. Hence, the maximum velocity of the mass is 0.4 m/s. (c) at the maximum compressed position. In what way do these functions for SHM differ from each other, in frequency, in amplitude or the initial phase? The functions neither differ in amplitude nor in frequency. They differ in intial phase. 14.11. Figures 14.29 correspond to two circular motions. The radius of the circle, the period of revolution, the initial position, and the sense of revolution (i.e. clockwise or anti-clockwise) are indicated on each figure. Obtain the corresponding simple harmonic motions of the x-projection of the radius vector of the revolving particle P, in each case. 14.12. Plot the corresponding reference circle for each of the following simple harmonic motions. Indicate the initial (t = 0) position of the particle, the radius of the circle, and the angular speed of the rotating particle. For simplicity, the sense of rotation may be fixed to be anticlockwise in every case: (x is in cm and t is in s). Phase angle, Φ = 5π/6 = 150°. Angular velocity = ω = 2π/T = 3rad/sec. The motion of the particle can be plotted as shown in fig. 10(a). Phase angle, Φ = -π/6 = -30°. Angular velocity, ω = 2π/T = 1 rad/s. The motion of the particle can be plotted as shown in fig. 10(b). Angular velocity, ω = 2π/T = 2 rad/s. The motion of the particle can be plotted as shown in fig. 10(c). Angular velocity, ω = π rad/s. The motion of the particle can be plotted as shown in fig. 10(d). 14.13. 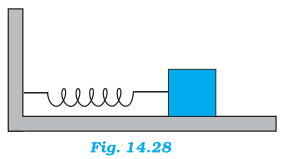 Figure 14.30 (a) shows a spring of force constant k clamped rigidly at one end and a mass m attached to its free end. A force F applied at the free end stretches the spring. Figure 14.30 (b) shows the same spring with both ends free and attached to a mass m at either end. Each end of the spring in Fig. 14.30(b) is stretched by the same force F.
(a) What is the maximum extension of the spring in the two cases? (b) If the mass in Fig. (a) and the two masses in Fig. 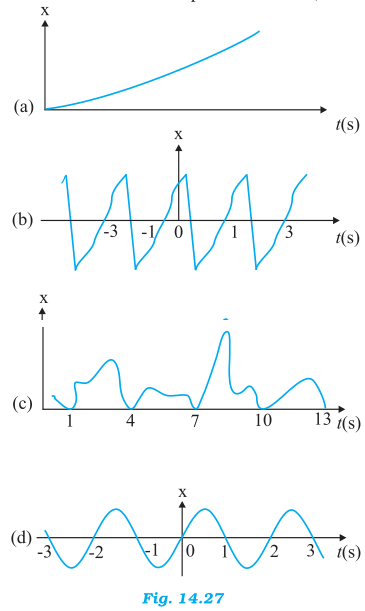 (b) are released, what is the period of oscillation in each case? (a) The maximum extension of the spring in both cases will = Flk, where k is the spring constant of the springs used. As, this F is directed towards mean position of the mass, hence the mass attached to the spring will execute SHM. In Fig.14.30(b), we have a two body system of spring constant k and reduced mass, µ = m × m / m + m = m/2. 14.14. The piston in the cylinder head of a locomotive has a stroke (twice the amplitude) of 1.0 m. If the piston moves with simple harmonic motion with an angular frequency of 200 rad/min, what is its maximum speed? Angular frequency of the piston, ω = 200 rad/ min. vmax = Aω = 200 × 0.5 = 100m/min. Hence, the time period of the simple pendulum on the surface of moon is 8.4 s.
T = 2π √m/k. A simple pendulum executes SHM approximately. Why then is the time period of a pendulum independent of the mass of the pendulum? Think of a qualitative argument to appreciate this result. (c) A man with a wristwatch on his hand falls from the top of a tower. Does the watch give correct time during the free fall? (d) What is the frequency of oscillation of a simple pendulum mounted in a cabinthat is freely falling under gravity? (a) For a simple pendulum, force constant or spring factor k is proportional to mass m, therefore, m cancels out in denominator as well as in numerator. That is why the time period of simple pendulum is independent of the mass of the bob. For large θ, sinθ is greater than θ. This decreases the effective value of g.
(c) Yes, because the working of the wrist watch depends on spring action and it has nothing to do with gravity. (d) Gravity disappears for a man under free fall, so frequency is zero. 14.17. A simple pendulum of length l and having a bob of mass M is suspended in a car. The car is moving on a circular track of radius R with a uniform speed v. If the pendulum makes small oscillations in a radial direction about its equilibrium position, what will be its time period? 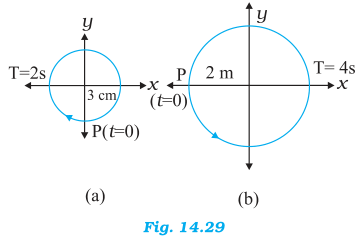 The bob of the simple pendulum will experience the acceleration due to gravity and the centripetal acceleration provided by the circular motion of the car. where ρ is the density of cork. (Ignore damping due to viscosity of the liquid). Let the cork be depressed slightly by x. As a result, some extra water of a certain volume is displaced. Hence, an extra up-thrust acts upward and provides the restoring force to the cork. 14.19. One end of a U-tube containing mercury is connected to a suction pump and the other end to atmosphere. A small pressure difference is maintained between the two columns. Show that, when the suction pump is removed, the column of mercury in the U-tube executes simple harmonic motion. Let l be the length of the total mercury in the U-tube. Hence, the mercury column executes simple harmonic motion with time period 2π √l/2g . 14.20. An air chamber of volume V has a neck area of cross section a into which a ball of mass m just fits and can move up and down without any friction (Fig.14.33). Show that when the ball is pressed down a little and released, it executes SHM. Obtain an expression for the time period of oscillations assuming pressure-volume variations of air to be isothermal [see Fig. 14.33]. The pressure inside the chamber is equal to the atmospheric pressure. Let the ball be depressed by x units. As a result of this depression, there would be a decrease in the volume and an increase in the pressure inside the chamber. In this case, stress is the increase in pressure. The negative sign indicates that pressure increases with decrease in volume. 14.21. You are riding in an automobile of mass 3000 kg. Assuming that you are examining the oscillation characteristics of its suspension system. The suspension sags 15 cm when the entire automobile is placed on it. Also, the amplitude of oscillation decreases by 50% during one complete oscillation. Estimate the values of (a) the spring constant k and (b) the damping constant b for the spring and shock absorber system of one wheel, assuming that each wheel supports 750 kg. There are 4 springs in parallel to the support of the mass of the automobile. The amplitude of oscilliation decreases by 50 %. 14.22. Show that for a particle in linear SHM the average kinetic energy over a period of oscillation equals the average potential energy over the same period. It can be inferred from equations (i) and (ii) that the average kinetic energy for a given time period is equal to the average potential energy for the same time period. 14.23. A circular disc of mass 10 kg is suspended by a wire attached to its centre. The wire is twisted by rotating the disc and released. The period of torsional oscillations is found to be 1.5 s. The radius of the disc is 15 cm. Determine the torsional spring constant of the wire. (Torsional spring constant α is defined by the relation J = –α θ, where J is the restoring couple and θ the angle of twist). α is the torisonal constant. Hence, the torsional spring constant of the wire is 1.972 Nm rad–1. 14.24. A body describes simple harmonic motion with amplitude of 5 cm and a period of 0.2 s. Find the acceleration and velocity of the body when the displacement is (a) 5 cm, (b) 3 cm, (c) 0 cm.